This is, for all intents and purposes, a Magma album recorded under a different name. The original intent by producer Laurent Thibault was to create an album that would be sort of like an introduction to the Magma sound, leading the listener from the more accessible jazz-rock sounds of the day slowly into the unique world of Magma. Consequently you have songs at the beginning (side one of the original album) that may remind of Soft Machine or Blood, Sweat & Tears, while songs near the end sound like Magma circa the second album (1001 Centigrades). The album features three different vocalists: firstly Zabu, then Lionel Ledissez, and finally Klaus Blasquiz. The lineup is essentially the same as the second Magma record: Vander, Cahen, Moze, Lasry and Seffer, the only difference being Tito Puentes who replaced Louis Toesca. So the question becomes: Is this a good introduction to Magma? I say no - this album is only a good introduction to Magma at that point in time... it must be remembered this was before Mekanïk Destruktïw Kommandöh, the album that changed Magma's sound forever. This is, however, an album that should eventually be in every Magma fan's collection. Incidentally, the initial run of this album was only 1500 copies, making it a mega-rarity. An early 80s reissue was released briefly on the Cryonic label, but this too disappeared quickly. Musea has done a splendid job on the CD reissue, the information in the booklet alone is worth the price of the disc! Laurent Thibault conceived of the Univeria Zekt project as a way to introduce Magma to a wider audience. The idea was to ease people into the complexities of Magma’s music by the music on side one and then climaxing with Christian Vander’s excellent "Africa Anteria." The first five tracks are tame by Magma standards drawing comparisons to Zao, Weather Report, and Chicago circa their first three albums. Musea is to be commended for reissuing this classic Magma spin-off. Consistent with Musea’s practice this CD contains extensive liner notes and the original artwork both on the booklet and reproduced in color on the CD. <em>The Unnameables</em> is an essential reissue for the Magma fan. 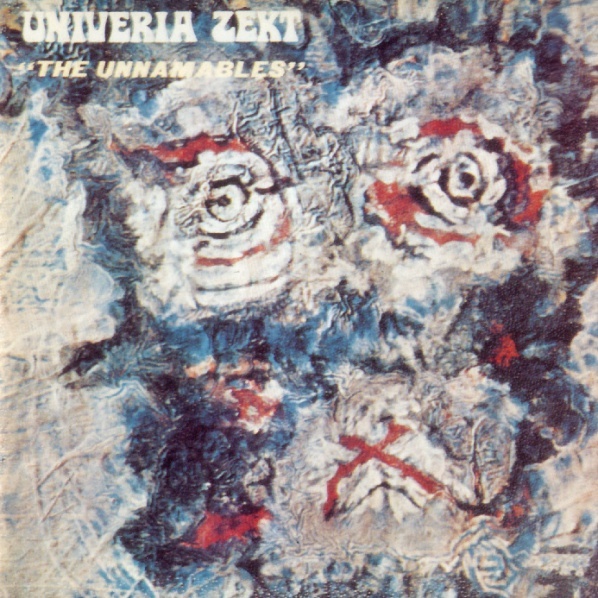 A Magma album in disguise, The Unnamables was designed to ease listeners into the musical world of Magma. Recorded by essentially the same lineup as on 1001 Centigrades, the album basically reiterates the stylistic development shown through Magma's first two albums, while abandoning the science fiction concept of the Kobaïan story. Three tracks from Lasry and one from Cahen on the first half of the album approximate the accessibility of the more well-known jazz-rock of the time. Vander's pieces on the second half of the album, however, begin to explore similar musical ground to that found on 1001 Centigrades. There is nothing here that is unique in the development of Magma's sound or style, but The Unnamables does contain some worthwhile and engaging music from the first phase of Magma's existence.